I left at 7:40, stopped at the gas station to fill up, then went north on Winston Churchill. 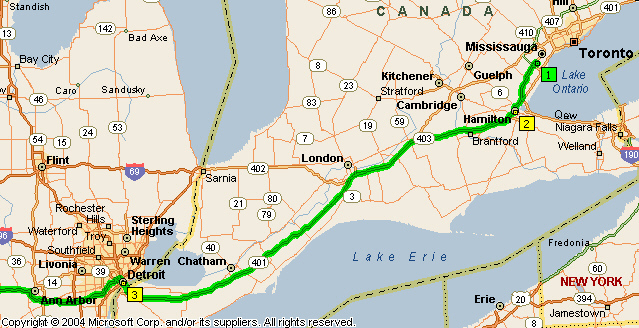 I decided to turn off ON-403 and drive through Hamilton and Bradford (beautiful farming country) to join up with ON-401 just before Woodstock. Today was not to be one for playing tourist - simply to reach a destination. Stops were, therefore brief - coffee, US Customs at the Michigan border (Detroit) and gas at Portage, Michigan. I arrived at my friends, Janice and Kevin’s at 4:33 (local time) 836.1 km - 519.5 miles from home ands almost ten hours after setting out. Had a relaxed breakfast before leaving for our day’s outing in Chicago. Kevin drove his car and our first stop was Frank Lloyd Wright’s Oak Park home and studio. Here we did a tour of both premises and walked down Forest Avenue to see a number of homes designed by Wright. Once having gained an idea of the style of his architecture, it was easy to pick out his houses. We also drove past Unity Temple, designed in 1905 by Wright. Frank Lloyd Wright was born in 1867. Undoubtedly the most influential figure in American architectural history, at the time of his death in 1959, Wright had completed 638 designs. Few artists in any field have matched his energy and productivity, his imagination range or the breadth of his vision. Oak Park, Illinois, just 10 miles west of downtown Chicago, contains the world’s largest collection of Frank Lloyd Wright architecture. Between 1889 and 1909, Wright build 25 structures here, including Unity Temple and his own home and studio. It was here that Wright developed his renowned Prairie style of low, earth hugging dwellings that would change the course of 20th - century architecture. Interspersed with Wright’s Prairies work is Oak Park’s legendary collection of Victorian homes. From Italianate to Queen Anne to Prairie, the architecture of Oak Park remains an outstanding representation of turn-of-the-century American design. Frank Lloyd Wright’s Oak Park home and studio is the birthplace of the Prairie school of architecture, the first distinctly American style of design. Between 1889 and 1909, the building served first as the architect’s private residence and eventually as his professional office. The richly inventive and prolific 20-year period is referred to as his “first golden age”. Wright used his own home and studio as an architectural laboratory, and the complex documents the evolution of the Prairie school principles. In form and structure it offers a permanent visual record of his continuous exploration of the relationship of light, form and space. In his Oak Park home and studio, Wright established the fundamental principles that guided his life's work - his philosophy of organic architecture. Here he launched a revolution that changed forever the way we think about the American home and the 20th-century architectural landscape. In 1898, Wright added a four-room studio complex onto his home, joining his private and professional lives on a single site. The studio, with its two-story octagonal drafting room and corresponding library, is a distinctly Prairie style structure. Here, working with 15 apprentices, Wright completed approximately 150 commissions, including 31 in the Oak Park and neighboring River Forest. Throughout the next decade, Wright continually refined and adapted his Prairie School principles, producing startlingly original designs like the Robie, Coonley, Dana and Darwin Martin houses, as well as Unity Temple and the Larkin building. Frank Lloyd Wright used the cube, cone and sphere as motifs for his decorative designs. His personal symbol is denoted by a cross, circle and square. Frank Lloyd Wright’s Oak Park home and studio are located at the corner of Chicago Avenue and Forest Avenue. This is where he raised a family, opened an office and perfected his Prairie School style. In 1889,22-year-old Frank Lloyd Wright borrowed $5,000, purchased a wooded lot and built a modest cottage for his 18-year old bride, Catherine Tobin. The original home with its prominent gables, window bays and dark, shingled surfaces reflects Wright's early interest in the Shingle style houses popular on the Atlantic coast. The building's simple geometry, broad eaves, bands of windows and open interior spaces, however, are features Wright would develop a few years later in his Prairie style residences. The Wrights raised six children in the home, expanding and remodeling the building to meet the demands of their active family and social life. In 1895, Wright added a formal dining room and a spectacular, barrel-vaulted playroom. In these spaces, he incorporated furnishings, art glass and lighting into his first totally unified design statement. Then we headed into downtown Chicago (it was too hazy to make a trip to the top of the world's tallest building, the Sears Tower, worthwhile). We did do some sightseeing on foot, however, after we had a buffet lunch at "The Old Carolina Crab House" at North Pier. We had an enjoyable walk along the Chicago River and around some of the lovely buildings such as the Chicago Tribune and the Wrigley Building. The boat cruise from the river out into Lake Michigan and along the city’s waterfront was quite impressive. Today I left Lisle at 8:40 to set out for my trip west to Salt Lake City, but wasn’t quite sure just which way I wanted to go. At Kevin’s suggestion I decided to head for Galena (an historic town with beautiful Victorian homes) and zig-zagged north and west from Lisle to IL-64. I hade a picnic lunch at Savannah on the banks of the Mississippi River, then drove north to the Mississippi Palisades State Park, stopping at several lookout points. From here I returned to Savannah (5 km - 3.1 miles) to take the bridge across the Mississippi River into Iowa. At Sabula I turned north on what was supposed to be a scenic route, but was mostly cornfields. Bellevue was a pretty town on the Mississippi, but after another 30 km (18.6 miles) I decided it was time to look for a road south west to get me onto I-80. To make up for lost time I stayed on I-80 until near dark when I booked in at the Heartland Inn, Council Bluffs (just before crossing the Missouri River and the Nebraska border). A day of happy experiences developed from one that started out without much promise. It was very cloudy and much cooler, but I managed to pack the car and be on my way (8:00) before the rain commenced. Within five minutes I had crossed the Missouri River into Nebraska and had just passed the outskirts of Omaha when heavy rain began to fall. I drove for three hours along I-80, taking a twenty-minute a break during a brief lull in the rain at the Kearney Rest Stop. By noon the clouds were lighter and although it was still drizzling the sun was trying to make an appearance and had pushed through the clouds by the time I arrived at Gothenburg. Here I decided to leave the interstate and do a little exploring. Just off the highway I visited a Sod House before going into the town to see an original Pony Express Station. I admire the efforts of people who worked to preserve such monuments of history. From Gothenburg to North Platte I followed US-30. There was much water lying around and some houses were completely surrounded - apparently 3 inches of rain had fallen during the night. I had lunch in North Platte, then decided to return to I-80 stopping again at an Information and Rest Center about six miles before Ogallala. At this point I discovered that a northwest detour would take me along a section of the historic Oregon Trail. I took the precaution of booking ahead for a motel in Scottsbluff (only 135 miles away, but how long would it take me?) I continued into Ogallala, then exited on US-26, a National Historic Trail. From a lookout at the top of a hill above Ogallala there was a good view to the east of Lake McConaughy and the plains. At Ash Hollow State Historical Park I followed the walking trail to the cave in the bluff. Then I drove back 2½ miles to Windlass Hill, where I hiked up the trail to the top of the hill. I could see the erosion where the wagon wheels had cut into the hill. The farms were very rich looking around Bridgeport, where I crossed the North Platte River. I took a distant picture of Courthouse and Jail Rocks from Bridgeport, because it was getting late and I needed to press on without further detours (still wish I could have gone out to the Rocks). I stopped at Chimney Rock Viewpoint before going onto Scottsbluff, arriving at the Lamplighter Motel at 6:30 (approximately 4 hours for the 135 miles and I could easily have taken longer!) I unpacked the car, went to a steakhouse for dinner, and before retiring for the night studied my tourist literature trying to make up my mind about what to do the next day - just so much to see and do! In spite of the disappointing weather during the morning, the day had proved to be an exciting one. The rugged country through which I passed in the afternoon really does something for me and I couldn’t have been more pleased about my decision to follow the Oregon Trail from Ogallala to Scottsbluff. Again it rained heavily during the night but eased up by morning. There was still fine misty drizzle when I left the motel at 8:30 to head up NE-92 to Scotts Bluff, the top of which was hidden in the clouds. I drove up to the summit where I spent an hour walking along trails through beautiful ponderosa pines to various lookouts. Whilst there the clouds lifted, gradually dispersed and the sun appeared. Back at the base of Eagle Rock I spent about 25 minutes at the Visitors Center and Museum (just too much information to absorb in such a brief visit). The morning already half gone, and as much as I wanted to continue on along The Oregon Trail, I realized that I was heading in the wrong direction and needed to go south again! I returned back along NE-92 to NE-71 and turned south for I-80. I had a brief stop and walk at a Scenic Viewpoint, in the Wildcat Range, with a wonderful view across a valley of rich farming land and Scotts Bluff in the background. It was only a half-hour drive on an excellent road across undulating fertile land to Kimball and onto I-80. From here the 62 miles to Cheyenne was an interesting drive with much to see along the way - oil pumps all over the place, bare grassy hills or lots of yellow flowers, cattle, some farming, rocky eroded ravines, a field of stacked hay, range country - could see for miles. Crossing the Wyoming border, there were more oil pumps, corn fields, irrigation sprinklers, a little old stone house with a chimney, rolling prairie, a range of mountains coming into view, large numbers of sheep, big oil refinery ... Was I Bored? Taking an hour and a half break in Cheyenne, I did a self-guided tour of the Wyoming State Capitol, a magnificent building, and gathered some interesting fact sheets about Wyoming. In 1869, Wyoming’s territorial legislature became the first government in the world to grant “female suffrage” by enacting a bill granting Wyoming Women the right to vote. The act was signed into law on December 10 of that year by Governor A. J. Campbell. Less than three months after the signing of that act, on February 17, 1870, the “Mother of Women Suffrage in Wyoming” - Ester Hobart Morris of South Pass City - became the first woman ever to be appointed a justice of the peace. On March 7, 1870, women were first empanelled for service on a jury in Laramie. Laramie was also the site for the first equal suffrage vote cast in the nation by a woman - Mrs. Louisa Swain on September 6, 1870. In 1894, Estelle R. Meyer (Mrs. Cort F.) became the first woman in the United States elected to a public office, that of Wyoming State Superintendent of Public Instruction. In 1924, Mrs. Nellie Taylor Ross was the first elected woman governor to take office in the United States. She took office on January 5, 1925, 20 days before “Ma” Ferguson of Texas (elected on the same day) took office. Mrs. Ross went on to become the first woman to be appointed Director of the United States Mint - a position she held for 20 years, from 1933 to 1953. In 1991, women held three of the state’s five top elective positions and a total of 23 women held seats in the Wyoming Legislature, three in the Senate and 20 in the House. Another interesting fact sheet listed a number of Wyoming Firsts. John A. Campbell, Wyoming’s first Territorial Governor, signed a bill December 10, 1869, making Wyoming the first state to grant women the right to vote. Ester Hobart Morris was appointed February 17, 1870 in South Pass City. The first all women jury was sworn in March 7, 1870 in Laramie. In 1872 Congress named Yellowstone National Park in northwestern Wyoming as the first national park in the world. Authorities claim that Thomas A. Edison conceived of the idea which led to this great invention while camping at Battle Lake, near Saratoga, Wyoming in 1878. Cleveland, Ohio had its public square lighted in 1879 and Cheyenne had its streets brightened by these lamps in 1882. The Laramie County Public System was organized in August of 1886. Wapiti Ranger Station was established in the Shoshone Nationa Forest in 1891. Mrs. Nellie Taylor Ross was elected to complete the term of her husband who died in office. She served from 1925 to 1927. In 1933 President Franklin D. Roosevelt appointed her the first woman to head the U.S. Mint, a position she held until 1953. In 1907 Wyoming passed the first law in the U.S. requiring professional engineers to register and to show certification of competency. I drove back through town, stopping for lunch at Best Western's "The Hitching Post" before returning to I-80. Traveling west on I-80 the terrain became quite rugged with many deep gullies. I noticed snow on high mountains to the south (probably in Colorado). The Sherman Mountains lay ahead like mounds of rocks and i felt myself experiencing some frustration in that it was impossible to capture the spirit of this land on film, so vast is the expanse of this land. I stopped at a "Point of Interest" a tree growing in solid rock. What a surprise I had when I saw a sign which read "Continental Divide El. 8,640 feet" - no wonder my ears had popped some distance back!!! I stopped here to see the Lincoln Monument and visit the Information Center, where it was suggested that I might enjoy a detour south of I-80 along WY-130, the Snowy Range Scenic Byway, through the Medicine Bow Range. It was a long downhill drive on I-80 from the Lincoln Monument, following the route of a canyon to its base before coming out onto the Laramie Plains. 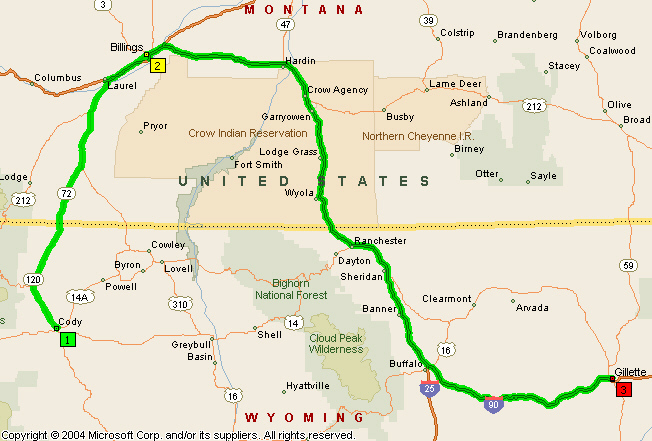 It was already 3:30 when I crossed the Laramie River, left I-80 and turned onto WY-130. Passing through rolling grasslands, I saw my first herd of antelope. To the south lay snow-capped mountains of Colorado. I saw many more antelope, sheep, and cattle ranches as I headed towards the town of Centennial, El. 8,076 feet, pop. 100, at the foot of the mountains. Beyond the town the rocky slopes were tree-clad and a sign read "open Range - loose cattle". It was 4:10 when I reached Lobby Flats, the highest point of he road, El. 10,847 feet. There were wonderful views from the stone observation deck, but it was very windy and rather cold. I made several other stops whilst in the area - Medicine Bow Observation Point, Mirror Lake and Lake Marie before continuing on. A sign read "Steep grade for 10 miles" and though the road leveled a bit for a short distance it still continued to descend for another 10 miles. Shortly before the junction with WY-230 I crossed the North Platte River, the headwaters of which originate in the mountains of Colorado. Although I didn't make further stops, I passed through some very interesting country - "Welcome to Saratoga" El. 6,786 feet, pop. 2,410, - North Platte River again with vertical bluffs above the river to the left and mountains to the right ... antelope grazing ... could see trucks traveling along I-80 ... view for miles around, surrounded by mountains ... 7½ miles later I joined I-80 ... a double row of rocks to the north looked like the Great Wall of China ... North Platte River ... Sinclair (refinery - the West's most modern) ... passed a U-Haul with plates from Utah, hauling a trailer with Florida plates and loaded with a car with Ohio plates!! I arrived at Rawlins, El. 6,785, pop. 11,575, at 6:10, totally ecstatic about all I had done and seen. I booked in at a Days Inn, had a pleasant supper and an early night. I left Rawlins soon after 8 o'clock and the two hour drive from there to Rock Springs was far from boring ... Rawlins nestled in a hollow with a backdrop of barren hills ... back on I-80 ... gates on either side of the road indicated that the road could be closed ... Continental Divide, El. 8,000 feet ... barren land ... flat valleys ... badland knolls to the north ... red bluffs to the south ... Herefords grazing ...herd of antelope ...could still see the mountains behind me ... land fairly flat now, but undulating ... distant view of more hills .. red, yellow and orange hills like painted desert ... evidence of oil or gas wells ... oil collection areas ... very high snow fences ... large flock of sheep .. soil becoming very red ... Red Desert ... buttes to the north ... red bluffs to the south ... Continental Divide, El. 6,930 feet ... lots of oil pumps ... refinery ... Table Rock ... Bittercreek Rest Area (solar powered) ... bluffs, stretching for miles ... town of Point of Rocks (indeed many points of rock, as if road going through a pass! ... barren rocky land: - bluffs, buttes, hills, valleys, gorges ... incredible scenery (I felt very excited driving through here) ... painted hills before me ... painted hills as far as the eye could see in any direction ... Exit-104 from I-80 ... Rocks Springs. I had coffee in Rock Springs and found a shopping plaza with a supermarket, so I could stock up on a few picnic supplies. Back on I-80 I drove to Green River, El. 6,190 feet, pop. 12,711, and thence detour on WY-530. After visiting the Information Center I returned to I-80 so I could drive through the tunnel under Castle Rock (I had remembered going through this tunnel by bus with the children in September 1979, and simply wanted to do it again to enjoy the astounding view ahead on leaving the tunnel). I then took the next exit to Green River and from this road had a very good view of Castle Rock. By this time it was noon and I was just setting out on my next adventure! I pulled into a "Picture Turnout" from which there was a good view of the area called The Chimney Pots and where I had my lunch. Soon after this the road crossed the Black Fork River and entered open country. About 15 miles further along I caught my first glimpse of the water of Flaming Gorge Reservoir and at the same time noticed many gophers (even one standing erect in the middle of the road - didn't even move as I drove by!) I went into Lucerne Valley, spending a few minutes at the Linwood Bay Historic Overlook. Just after 1 o'clock I crossed the border into Utah, and soon after that WY-530 ended at Manila where I turned on to UT-44. 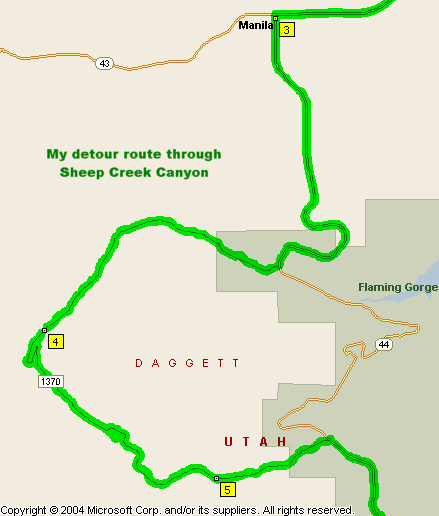 However about 8 miles down the road I decided to take a side trip through the Sheep Creek Canyon. What an exciting trip through this Geologic Area (so designated in 1962) where signs point out rock formations that span 600 million years of earth's history. The different layers of rock tell the story of the formation of the Uinta Mountains, the only range in the US that runs east-west. I rested below the Palisades and made myself another sandwich. Back on UT-44 the cliffs were very red, the grade of the road, both up and down, was quite steep at times and the mountain sides were covered with pine trees. I turned into Red Rock Canyon Overlook and walked along the trail on the rim of the canyon. 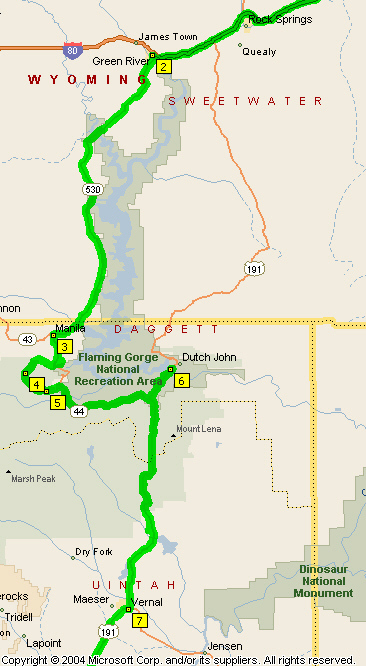 UT-44 ended at the junction with US-191, and before turning right to continue to Vernal I drove north on US-191 to go to the Flaming Gorge Dam (502 ft above river level). 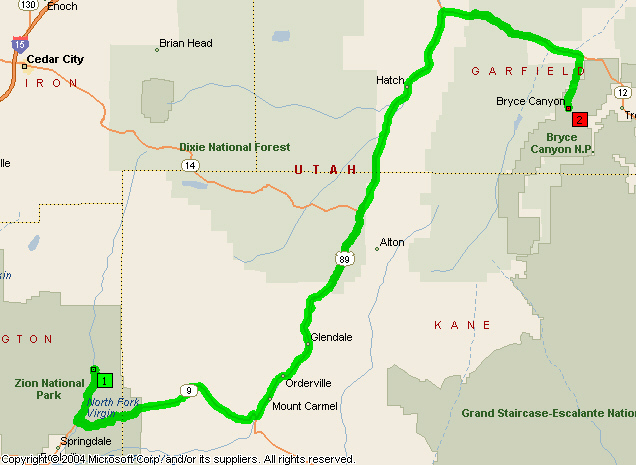 I then had to retrace my "steps" back to where UT-44 met US-191 and head for my destination - Salt Lake City! Again there was much to see, but I had to keep telling myself "push on." The pilot-led convoy ended at the start of the downgrade, and after 6 switchbacks many cars pulled into the Scenic Outlook from which there was an amazing view of Vernal and a lush green valley. It was after 5 o'clock by the time I reached Vernal and the junction with US-40 which would take me almost into Salt Lake City. I still had a long way to go(!! ), but I enjoyed the drive. There were beautiful flower pots along the main street of Vernal, and once out of the town it was one vista after another ... Uintah River - wide valley ... sign: Salt Lake City 152 miles ... Roosevelt, a pretty town in a fertile valley ... lots of irrigation sprinklers ... hills flat on top as if they had been sawn off ...Duchesne Basin ... bridge over Starvation Reservoir ... gradual rise for miles ... ears popped ... very old juniper trees ... stopped for a picture (Salt Lake City 98 miles) ... Wasatch County .. canyon ... Current Creek Dam ... a wonderful winding road with a passing lane all the way ... canyon ends and the hills not as rocky ... yellow through reds still showing through the grass ... road skirts around Soldier Creek Reservoir ... another canyon and steep down grade ... Heber Valley at the bottom of the canyon ... another range ahead ... Heber City ... beautiful fertile valley ... divided highway ... large dam wall of a new reservoir under construction ...over another range ... descend into Park City (didn't recognize it from the 1979 visit with the children - there were many new houses and chalets) ... finally junction with I-80 ,,, 6% grade ... Salt Lake City 21 miles. I had no problem finding the Olympus Hotel and arrived there at 8:10 after having had another wonderful day. The hotel gave me the same room that my cousin, Alice Smith and I would be sharing after her arrival on the Saturday. It was good to be able to fully unload the car and settle in. After a supper at the hotel's coffee shop I phoned an old friend from Canadian Ski Marathon days, Colt. The children and I had stayed with him in September, 1979, on our way to Australia, and I hadn't seen him since then. He arranged to meet me for a breakfast next morning. I met Colt this morning at 8 o'clock in the lobby of the Olympus Hotel and we spent the day together, first stopping to have breakfast and do a little shopping. 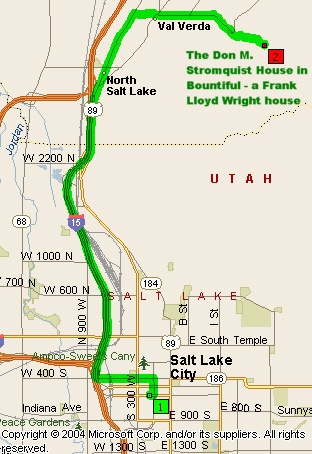 Colt took I-215 (Belt Route) south to Exit-6, then along Wasatch Boulevard, past the turnoff to Big Cottonwood Canyon and on to Little Cottonwood Canyon, which is a glacial formed canyon. Colt pointed out the Wasatch Fault and the entrance to the Mormon vaults high above the road. These vaults, built 600 feet back into solid granite rock and kept at a constant 65°, house all the original microfilms and records of the Mormon Church. It was just after noon when we arrived at Snowbird and we were able to take the 12:30 aerial tram to the top of Hidden Peak, El. 11,000 feet (El. at base - 8,100 feet). It took 20 minutes to reach the top, where the temperature was 54°. The floor of the valley (Salt Lake City) was 1 mile below us. Colt had worked at Alta (the next resort up the canyon) when 17 years old and had hiked all over these hills (mountains), so he was able to point out various peaks and their names, fault lines, fossil areas, and a rock glacier. We left Snowbird at 2:30 and went to Alta, at the top of the canyon, where houses are built into the sides of the hills (quite low key) to avoid avalanche damage. From Alta we were able to see the north side of Mount Baldy. Back in the city we had lunch at Kathie's, a wonderful health food sandwich and mineral water, Then Colt took me to his home where I met his father and his brother, Mark, who drove us and a canoe to the Jordan River, #1 on the map. We canoed down the river, Colt doing all the paddling, whilst I relaxed in an easy chair(!! 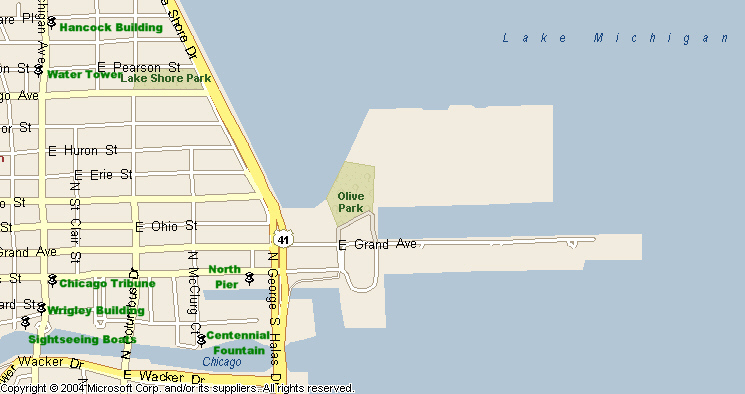 ), to Jordan Park, #2 on the map. Here we enjoyed a stroll through the International Peace Gardens. We then resumed canoeing down the river to North Temple, near Utah State Fair Grounds, #3 on the map, arriving exactly two hours after setting out and at the time arranged for Mark to pick us up. We returned to Colt's place, met his brother, Larry. who stayed with us in Canada, and had dinner with them and their father. After dinner Colt drove me back into town, stopping at several spots on the way: Liberty Park (avenue of trees, historic house, stone pillars of original gateway), Trolley Square (had a lovely frozen yogurt), past a couple of houses where Colt had done restoration work (bay window, stairs) and to the hotel by 10:45. We had traveled about 100 miles (160 km) by road and about 3 miles (4.8 km) on the river. Today I got up about 7:30, showered, dressed, had Weatbix and stewed plums for breakfast, tidied the room ready for Alice's arrival and wrote up my diary until Colt arrived about 9:30. Colt showed me where Smith's supermarket was located, then we drove to Red Butte Gardens and Arboretum at the University of Utah (above Fort Douglas). We had a wonderful walk through the gardens, partly formal and partly natural. I asked Colt why there were so many amphitheaters and concert "stages" in the Salt Lake City region to which his response was: Brigham Young, the second prophet said "they needed theaters with performing arts so that the creative mind (will) of the people could be expressed." We walked by beautiful flower beds, passed by a storyteller with a group of people, young and old, sitting around listening to a story, through a meadow garden and an archway of scrub oaks. We had an overall view across the valley to the Oquirrh Mountains 37 miles away! Our next stop after leaving the Red Butte Gardens, was at 452 800E to see the GILGAL Sculpture Garden (http://www.gilgalgarden.org/) with its many stone carvings. We arrived back at the hotel at 12:30 and had a light lunch at the Olympus Cafe before Colt left. I then had a quite afternoon, catching up with my diary writing, until it was time to take the shuttle bus to the airport. Alice's plane arrived at 4:05, and I was able to go right up to the gate to meet her. After collecting her luggage and phoning for the shuttle we were back at the hotel by 5 o'clock. Alice's luggage was very heavy - she said that she brought a tree with her! She gave me a beautiful jarrah cheese board which her brother had made. We sat and talked totally unaware of time passing. You would have thought that we had known each other all of our lives, instead of only having met on two brief occasions in December 1990. We actually talked until just after 7 o'clock, then drove to Immigration Canyon State Park to observe the sunset across the valley. The park wardens arrived at 8:05 to close the park and we had to leave. We returned to the hotel for supper and the continuation of our non-stop conversation. We had traveled about 11.9 miles (19.2 km) with Colt. Alice and I were up early this morning in order to be at Temple Square for the 8 o'clock guided tour prior to attending the Mormon Tabernacle Choir broadcast. Following the broadcast we walked west along North Temple and south on State Street to the Beehive House, 67 East South Temple. From its completion in 1854 until 1877, the Beehive House served as the official residence of Brigham Young, who was the second President of The Church of Jesus Christ of Latter-day Saints and the first governor of the Utah Territory. The house is a National Historic Landmark. The house received its name from the beehive atop the house, the beehive being a significant symbol of industry. From here we wandered through the church grounds (beautiful gardens, lovely fountain) and past the statue of Joseph and Emma Smith, going back to the hotel to have lunch at the Olympus Cafe. After lunch we returned to the vicinity of Temple Square to visit the Museum of Church History and Art (a good choice as a storm had arisen and there was pouring rain all afternoon). We asked a number of questions at the front desk and later in the afternoon the curator caught up with us and gave each of use a Book of Mormon. One item of great interest to me was a glass case displaying a pioneer diary. I was more pleased than ever that I had decided on the detour in Nebraska from Ogallala to Scottsbluff. It was 6:00 by the time we returned to the hotel. Again we sat and talked for a long time, then went for a late dinner (Mexican food) at Sophie Garcia's, across the street from the Olympus. Today we spent the morning at the Family Historical Library, (formerly the Genealogical Library), 35 North West Temple searching for references which could help Alice in her research of our ancestors. Never having done anything like this before I found the place interesting and was amazed at the number of people from far and wide who were engaged in research of their families. The Family History Library is the largest library of its kind in the world and is open to the public free of charge. It was mid afternoon by the time we stopped for lunch, which we had at Dee’s Restaurant on North Temple before returning to the hotel. We collected our cameras and drove out to The Great Salt Lake. From where we could park the car it was a long walk (we estimated well over a mile) mostly across dry mud flats to try and reach the water, but it did become wet and muddy and we could not make it to the water’s edge. The Great Salt Lake is the largest lake west of the Mississippi. Only The Dead Sea has a higher salt content than the Great Salt Lake. The lake’s salinity varies, but percentages of salt have been as high as 27%, which is 8 times saltier than the ocean. Before leaving the area we drove a little further west to Saltair, or what was left of it after the storms of the 1983-84 winter. The unpredictable and extremely dynamic Great Salt Lake began an unprecedented rise. Never before in recorded history had the lake risen so fast, or so high. The Lake in April 1987, was higher, deeper, and larger than ever before in recorded history. Then, in the summer of 1988, it did a 180° turn around and began dropping like a rock, hence the extensive mud flats leading out to the shoreline! Whilst at Saltair we looked through the gift shops which are located in two early rail cars. We left Saltair just after 7 o’clock and drove to “This is the Place” Pioneer monument for a second time to take pictures of the sunset. Whilst there a deer came up over the hill and ran past us. Also we saw a covey of crested quails (too dark to get a picture of either!) In the meantime a thunderstorm was fast developing over the valley to the south. From the Pioneer Park we went to Trolley Square where we looked around at some of the historic store fronts before having dinner at Charlie Chows Chinese restaurant. We each order a bowl (as opposed to a cup) of soup and to our horror the bowls were serving size - enough for two, three or four people! We tried to have an early start today so we could be at the Family History Library when it opened as we wanted to view some films of Jewish records. We found little of any use, but I was fascinated by the way one can go about getting information, even if it is a slow process! Our eyes were tired after 2 ½ hours, so we decided to do some sightseeing. We drove up Little Cottonwood Canyon to Snowbird, arriving at 1:30. We both enjoyed the trip on the aerial tram but found it quite chilly at the top (45° - 15° colder than at the base of the tram), hence we did not stay long! We had a late picnic lunch at the side of the road halfway down Little Cottonwood Canyon. We then decided to drive up through Immigration Canyon, through which the pioneers had entered the valley, cut across to I-80 and return to Salt Lake City through Parley’s Pass. We returned to the hotel by 6 o’clock. Colt met us for dinner at the Olympus Café, and afterwards took some of my things home so I wouldn’t have to take everything with me for our three-day jaunt south. 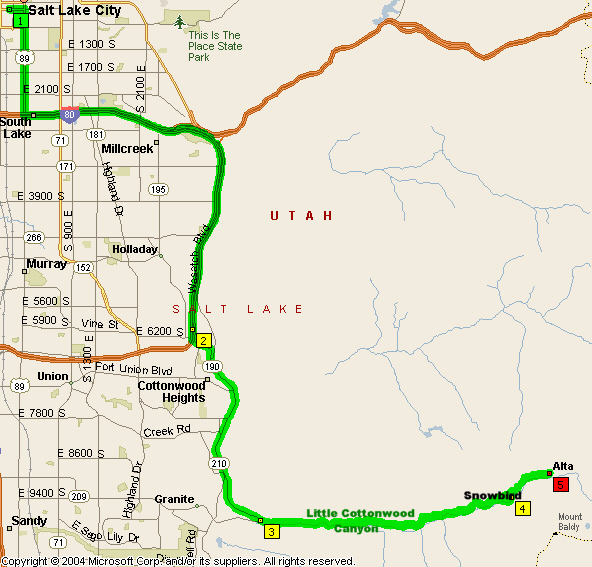 Distance for Saturday to Tuesday around Salt Lake with Alice 150.1 miles (241.5 km). On waking this morning I felt very excited because I would be seeing some amazing country over the next three days and visiting three National Parks, places I’ve always wanted to see. Leaving the hotel just before 9 o’clock we were soon driving south on I-15. For miles we could see the Bingham Copper Mine to the west and planned a visit there after returning to Salt Lake City. Within half an hour we were passing through Lehi [much industry - many chimneys and a white cloud of smoke hung over the valley], American Fork and Orem [then home of Word Perfect (WP) software]. Utah Lake came into view near the Brigham Young University. Beyond the city limits the mountains were tinged red with fall colors. We did not stop in the fifty miles between Thistle and Manti, but Alice noted down many things along the way:- abandoned houses near Thistle, swamp (bulrushes) by the roadside, deer, many tiny birds (maybe finches), valley becoming wider and flatter, sheep, cattle, only an occasional patch of red bushes on distant hillsides, soaring eagle, sign that there could be cattle on the road (open range), swallows darting overhead, sprinklers - long pipes on wheels watering entire fields, pretty houses in Mt. Pleasant - LSD Church, Wasatch Academy, Museum, old railway station (no sign of tracks) - followed for many miles the route of the train line, the tracks and ties long since gone, turkey farm (hundreds of white turkeys), Ephraim - IN THE HEART OF UTAH, large cattle yards. We stopped in Manti to photograph the LSD Temple, built there in 1888, a very beautiful structure set upon a hill. Continuing on from Manti we passed through a very green, irrigated agricultural area (rotary sprinklers), after which the hills started to really change to many colors, rugged bluffs had agricultural land right up to their base, bales of hay, open range country, Central Utah Correctional Facility, Gunnison, El. 5,215 feet, - was one of the first places to be granted a one-weekly mail service - a very arid town where we stopped momentarily at a park, dedicated to pioneers. After Salina we joined I-70 for 5 miles, then exited on UT-24 for Sigurd to have our lunch at a wayside park with a beautiful view of the mountains. In the park was a cairn and plaque for “Cedar Ridge Battle” - Black Hawk mortally wounded here. On the other side of Sigurd we passed a very large gypsum operation - Georgia Pacific Gypsum. At Torrey we left UT-24 and turned onto Scenic Byway UT-12, the Clem Church Memorial Highway, and what surprises we had in store for us! - two more cyclists, even more loaded than the earlier two - crazy!, open range country, Dixie National Forest - road can be closed in winter, trees (pines, some aspens) getting larger, El. 8,000 feet, Garfield Country, lookout - Mt. Ellen, 11,618 feet, to the east, pine forests change to thick aspen, road summit El. 9,200 feet, picture stop, deer by the roadside, Steep Creek Overlook followed by 8% drop for 1½ miles, El. 8,000 feet, weather gates (to close the road in winter if necessary), Boulder, 5:35-6:00 - Anasazi Indian Village State Park. 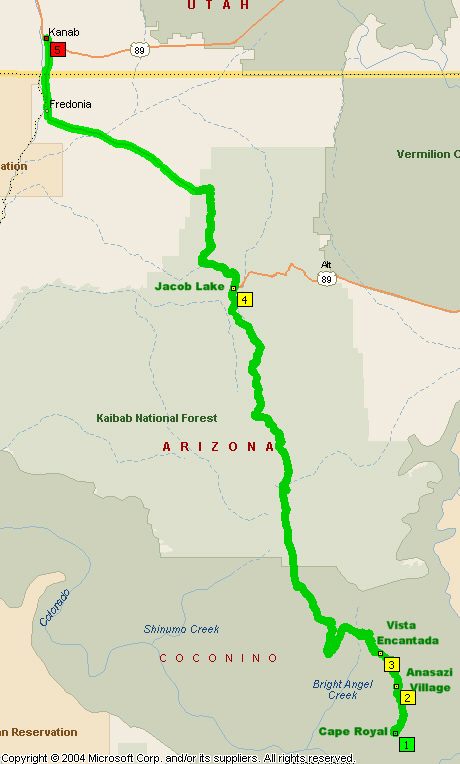 The next section of the road had canyons on either side and could be called “Devil’s Backbone”, but this name was reserved for a Scenic Byway a little further west. We reached Escalante at 6:55, but had to push on (we had a motel booking further on - had not realized that there would be so much superb country to see the first day - narrow valley between vertical rock cliffs, Table Cliff Plateau, 12% grade - sharp curves, Henrieville, Tropic - El. 7,619 feet, 8:18 - junction with US-89, the same road we had been on earlier in the day, and at 9 o’clock we arrived at Golden Hills Motel, Mt. Carmel Junction - a long, but very exciting day. We unpacked the car, then walked across the road to have dinner at Best Western’s Thunderbird Restaurant. Here we learned that the road to Zion was closed due to an earthquake that morning. Grand Canyon, Zion and Bryce Tour 388.9 miles (625.9 km). Today our plan was to go south into Arizona to Grand Canyon’s North Rim and to return to Utah. We set out from Mt. Carmel Junction before 8:30 and were in Arizona twenty-five minutes and 32.6 km (20.3 miles) later - Fredoria, founded 1859, El 4,671 feet (193 miles to Flagstaff - Alice suddenly realized what I was really like and that I would have needed little encouragement to head in that direction). From Fredoria we crossed gently sloping prairie-like land, sage brush, wild flowers, could see the road ahead curving on into the distance, could see the top edge of bluffs on the horizon - decided that we were driving across a plateau, at 55.6 km (34.5 miles) - El. 5,000 feet, road winding again through gentle hills, Kanab National Forest, at 66.4 km (41.3 miles) - El. 6,000 feet, scenic viewpoint, lovely pine trees 86.3 km (53.6 miles) - Jacob Lake El. 7,921 feet, junction with AZ-67, the elevation of the north rim of the canyon, vegetation changed - includes firs and aspens, large cleared meadow within the forest, amazing forests so close to the canyon, two deer, Kanab Lodge set against trees on the edge of the meadow which extended to and beyond the National Park entrance, Park fee was $10.00 (7 day permit good for both North and South Rims!!! ), temperature was 60°. Within 20 minutes we had parked the car (156.3 km - 97.1 miles from leaving Mt. Carmel Junction) near the Grand Canyon Lodge. Here we spent the next 2½ hours, hiking to Bright Angle Point and back, via two other lookout points. We had a look in the lodge before wandering among the lovely cabins and back to the car. Our next destination was Cape Royal, but on our way out from the lodge we noticed a campground where there were a lot of mules, the ones which carry tourists down the narrow trails into the canyon. Even though we passed the turnoff we did not go into Imperial Point (highest point on the North Rim - 8,803 feet) “due to enemy” - TIME. For thirty kilometers (18.6 miles) we were driving across a forested plateau and when we first glimpsed the canyon again, it was hard to believe it was still there. We arrived at Cape Royal, 36.5 km (22.7 miles), from the lodge, at 1:45. We had our picnic lunch first then enjoyed a wonderful walk along the trail - interesting signs about the flowers, birds and animals, also a sign about lighting! On a distant ledge I spotted an unusual plant and after arriving back in Mississauga Alice and I were watching a National Geographic video of Grand Canyon National Park and behold, there was a picture of a plant along with a description: UTAH AGAVE - Agave Family Agave utahensis - lives 10 to 30 years, flowers only once, the flower stalk growing 3 to 10 inches per day to a height of 10 to 20 feet during the growing season, then the entire plant dies. We had views of a number of landmarks - Little Colorado River Canyon coming into the South Rim and the Painted Desert beyond that, also Desert View (7,438 Ft.) and the Watchtower on the South Rim, 10 miles from Cape Royal, Woton’s Throne. (When LP and I were in Phoenix, Arizona, in February 1976,we enjoyed a week-end trip to the Grand Canyon, South Rim, taking a rather circuitous route! We drove east of Flagstaff, north through the Painted Desert, then west through Cameron to the canyon, skirting around Little Colorado Canyon, and past the Watchtower Desert View). Soon after leaving Cape Royal we stopped at Walhalla Village, summer home to Anasazi families for over 100 years. The next stop was at Vista Encantadora, a vantage point with a view over the canyon and beyond to Indian country - Navaho and Hopi. Before leaving the park we saw more deer and some wild turkeys. 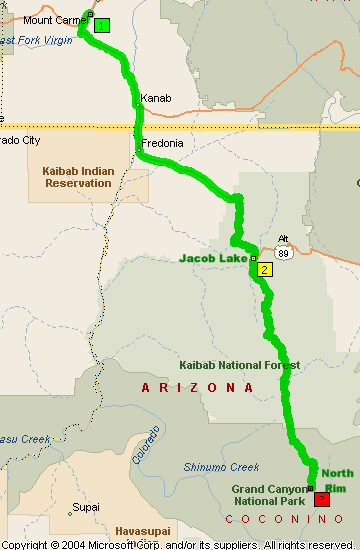 We arrived back in Jacob Lake by 6 o’clock, browsed through the gift shop for souvenirs, then headed for Kanab “The Greatest Earth on Show”. We stopped several times for pictures, including some small Joshua trees on the outskirts of Kanab, and arrived at Parry Lodge at 7:50. We settled into our room (beautiful decor - Laura Ashley prints), and walked across the street to a local café for our supper. 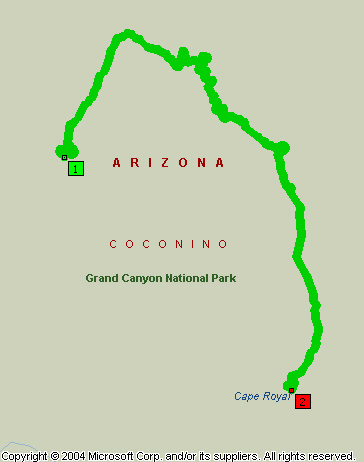 Grand Canyon, Zion and Bryce Tour 606.4 miles (976.0 km). We had a big day in front of us because, not only were we going to Zion National Park, we were also retracing our steps along Scenic Byway UT-12 to Bryce Canyon. Although we left the motel by 9 o’clock, it was 9:50 by the time we were on our way out of Kanab. First we had to get gas, then we stopped at a gift store. Outside the gift store were great blocks of stone which attracted our attention, On our way through Kanab the previous day we had seen the sign, “The Greatest Earth on Show” but had not realized the full significance of what it meant. The markings in the sandstone were truly amazing and thin slices of the rock presented ready-made pictures. Half way back to Mount Carmel Junction we stopped for pictures of the coral pink sand dunes along the side of the road (the Coral Pink Sand Dunes State Park was out to the west). A bit further along we stopped for another picture and realized that what we could see in the distance was the start of Zion National Park. 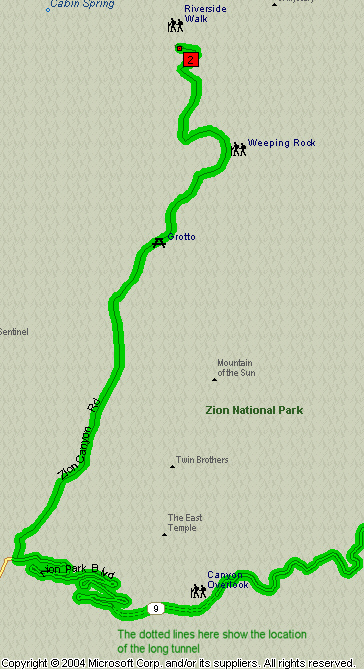 We reached Mount Carmel Junction by 10:30 and turned onto Scenic Bypass UT-9, which would take us into Zion. After stopping at the Checkerboard Mesa we passed through two tunnels, the second one, 1.1 miles in length, was completed in 1930 at a cost of $503,000. It connects the high plateaus of the east with lower Zion Canyon. Traveling from one side of the tunnel to the other the landscape changes dramatically. On the east is the Slick Rock country, where rocks colored in white and pastels of orange and red have been eroded into hundreds of fantastic shapes, etched through time with odd patterns of cracks and grooves. The mountain of sandstone known as Checkerboard Mesa stands as the most prominent example of this naturally sculptured rock art. On the west of the road descends the talus slope of Pine Creek Canyon in six switchbacks on a 5% grade into Zion Canyon. Driving back along the canyon we stopped at an Overlook at the same time as the tour train and could hear the commentary - thus we became aware of the rock climbers on the vertical cliffs above us! Just before Zion Lodge, El. 4,276 feet, we stopped at the Grotto picnic area, where we satisfied our hunger pangs with a late picnic lunch. 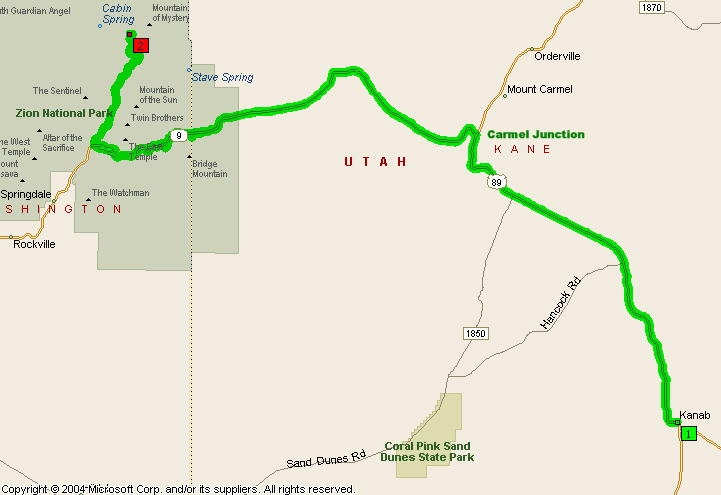 It was already 2:15 when we arrived back at the junction with Scenic Byway UT-9 (86.4 km - 53.7 miles, since leaving Kanab!) and 2:30 when we were on our way after pictures of the hairpin bends and airway arches for the long tunnel. We returned to Mount Carmel Junction, then north on US-89 and east on Scenic Byway UT-12, through Red Canyon, to an elevation of 7,619 feet just before the turnoff for Bryce Canyon at 4:30. During the next 2½ hours we drove to Bryce, Paria, Inspiration and Sunset Points, spending time at each of the lookouts, Had we been there earlier in the day it would have been great to have a hike along one or two of the trails, but even unable to do this, we felt that our visit had been worthwhile. You are standing on a drainage divide. Water that falls in front of you runs to the Paria River, a tributary of the Colorado - and surges through the Grand Canyon. Water that falls behind you trickles toward the East Fork of the Sevier River, winding northward and then westward into the deserts of the Great Basin and evaporates there, where rivers have no outlet to the sea.. The rim is not unchanging, though. On the steep side, water moves faster, with more power - power to cut away the rock - power to eat away the rim. Slowly, inexorably, storm by storm, and year by year, the rim retreats and the Paria River Valley steals land from the Great Basin. Upon leaving Bryce National Park, we returned to US-89 north, through Panguitch, then UT-20, which crosses a range, rising to a summit, El. ;7,910 feet, followed by an 8% grade down the west side and on to I-15 for our return trip to Salt Lake City. We had a dinner break in Beaver between 8:30 and 9:30, then drove non-stop, arriving at the Olympus Hotel at 12:30!! Grand Canyon, Zion and Bryce Tour 1,017.3 miles (1,637.2 km). My first concern this morning was to take the car to Chrysler, as its oil change and service were due. I didn’t have far to go and the job was done promptly. After this we had a quiet time at the hotel whilst waiting for Colt to arrive (he was to return my things which he had kept for me whilst we were touring). On our way to Smith’s Supermarket, we stopped at the “Artesian Well” still operating in the city. After lunch Alice went to the Family History Library to do further research and Colt and I drove north to Ogden. Colt had promised to show me a house which had been designed by Frank Lloyd Wright. After this we went to a large wallpaper warehouse for me to look for a trim in a southwestern design (no luck). I took Colt back to where his truck was parked, then went to pick up Alice. Before returning to the hotel we went back to Smith’s to collect the films we had left for developing. After supper we were ready for an early night. This morning we woke up and got ready leisurely for the day. When Colt arrived we showed him our pictures to date and chatted for a while, leaving the hotel at 10:30 for our trip to Kennecott Bingham Copper Mine. Having stopped for pictures on the way, it was 11:30 when we passed through the entrance gate to the copper mine. The history of the town began in August 1848 when two young Mormon pioneers, Sanford and Thomas Bingham, settled in this narrow wilderness canyon to herd cattle. Within a few years the area became a supplier of timber for local sawmills, Much of the timber used in the construction of the Salt Lake Tabernacle came from the canyon. In 1857 the Bingham brothers took samples of assayed ore to Brigham Young who advised them not to engage in mining at that time, Following the discovery of silver and gold containing ore in the fall of 1867, the West Mountain Mining District, embracing the entire Oquirrh Range was organized. In 1868 fewer than one hundred people lived in Bingham canyon. By 1880, the town had grown to a population of 1,022. About 1893 Colonel Enos A. Wall located ground containing millions of pounds of copper. The Utah Copper Company began large scale mining operations in 1904. The town was incorporated as a city on February 29, 1904. Involved in its history were people of many nations, Greeks, Italians, Armenians, Mexicans, Japanese, Chinese, British, and Austrians. The prosperous Bingham Mine led the nation in the production of copper, but the prosperity which built the town also hastened its death. The land where the town was located is now part of the Kennecott Copper open pit mine. The 1970 census indicated that the population of Bingham Canyon, once a roaring mining town of 15,000 had dwindled to thirty-one people. On November 22, 1971, a special proposition to dis-incorporate the town was passed. After 123 years Bingham Canyon was dead. The accident certainly caused a stir, with all kinds of people arriving on the scene - Emergency Medical Technicians, ambulances (Kennecott’s, Gold Cross, Copperton), shift supervisor, county paramedic truck, fire engine paramedic truck. Alice certainly brought everyone running! The Gold Cross Ambulance wanted $250.00 up front to take Alice to the hospital, so we said that we would take her ourselves. Alice was then asked to sign a release form absolving them of any responsibility - she couldn’t see to read the form, so Colt read it to her - she refused to sign, whereupon Kennecott Ambulance said they would take Alice. It was immediately obvious that they had a lawsuit on their hands! Colt and I followed the ambulance to the Holy Cross Jordan Valley Hospital. Once at the hospital Colt again kept a record of events, just as he had made some notes of everything at the accident site as it happened, as well as making some phone calls to Kennecott. Besides numerous bruises, Alice had cuts in her upper lip and nose, so a plastic surgeon was called in, a Doctor Clayton. He came directly from a church service at which he had just been the lay preacher. We finally left the hospital at 5:45, went to Smith’s for Alice’s prescriptions, had a frozen yogurt whilst waiting for them to be filled, and arrived back at the hotel at 7:40. Alice was feeling pretty shaken up and quite understandably just wanted to relax in our room, so we ordered room service. What a day!! And poor Alice - two black eyes, a nose splint and three lots of stitches, bruises and grazes - a wonderful brave lady with quite a sense of humor. We had a very lazy and relaxed morning as Alice needed to have a quiet time. After lunch, however, she was ready to go out for a short time. We went to Washington Square to see the City and County building, then the old city hall, now called Council Hall and is the home of the Utah Travel Council. From here we walked to the Capitol, enjoying both the beautiful grounds, the forty acre park surrounding the building, and a tour of the magnificent interior. Today would also be our last opportunity to return to Temple Square as there were still some pictures we wanted, and this we did on our way back to the hotel. On returning to the hotel we both had a rest before showering and dressing ready for dinner. When Colt arrived we sat and talked for a while before going upstairs to Mullboon’s Restaurant - a special dinner, which was Alice’s treat to say “Thank You” to Colt for all his help Sunday at both the mine and the hospital. First thing this morning Alice had to phone Kennecott (yesterday was a public holiday) to arrange to see them regarding the accident. An appointment was set up to see Lauri at their Copperton office after going to the Cottonwood Medical Center for a check up with Dr. Clayton. Dr. Clayton was very helpful and gave Alice a list of plastic surgeons (along our homeward bound route) because her stitches were to be removed Friday. Lauri Priano was also very helpful (I guess that when one wants to avoid a law suite, one goes out of the way to make sure of being helpful!!) Alice was given cash to cover her prescriptions, for hairdresser, for a new leather handbag and letters regarding fees for further medical treatment and all the items for which Kennecott would be responsible - ring, camera, sunglasses, teeth - after Alice’s return to Australia. Back in Salt Lake City, we went to Smith’s to pick up films, stopped in for a short time at the Mormon Handcraft Store and had a quick look around several stores (new bag for Alice) before returning to the hotel for supper and packing for our departure from Salt Lake City. Colt stopped by for a short time after supper and he and I went out to take some pictures of the Marmon Temple, which is beautifully lit at night. Our sojourn in the beautiful city of Salt Lake had to come to an end. Today we set out for our return to Mississauga, but we still had a lot of sightseeing to do on our way! We left the Olympus Hotel around 9 o’clock, but before heading out, stopped for photos at the corner of Main and South Temple Streets - Colt had told me the previous evening about the Meridian marker, the point from which all streets in Salt Lake City are marked. We then took I-15 north for 50 miles, exiting onto US-91 at Brigham City, heading east into the mountains, through Mantua (Summit El. 5,200 feet), through Wellsville (in a very wide valley) and thence to Logan and US-89. As we left Logan we entered another canyon, where people were fishing and we saw the sign for the ancient Lake Bonneville. A little further along we stopped to watch some rock climbers. It was noon when we reached Bear Lake Summit (El. 7,800 feet). What a beautiful sight! Bear Lake (El. 5,924 feet) was in the valley before us, an incredible aqua blue. Ten kilometers ( 6.2 miles) later we bought some items for our lunch and enjoyed a raspberry sundae - Bear Lake is know in the area for its raspberry crop - our sundaes were really delicious. Just after 1 o’clock we crossed the border into Idaho, 203.7 km (126.6 miles) after setting out from Salt Lake City. We drove through Saint Charles, birthplace of Gutzon Borglum, sculptor of South Dakota’s Mt. Rushmore, Paris, founded 1863 (first settlement near Bear Lake) crossed Bear River, Montpelier, settled 1841, drove into another canyon, Geneva Summit (El. 6,938 feet), Geneva, and at 274.1 km (170.3 miles), crossed the border into Wyoming - “Great Land Outdoors” . Alice’s notes are so full of information it is easy to recapture the whole trip. So continuing on from the Wyoming border: Salt Creek, Salt River Pass (El. 7,360 feet), 7% grade for three miles, 5% grade for one mile, Smoot (El. 6,613 feet; pop. 100) - crops, cattle, horses, - driving the eastern side of long and fertile valley - Star Valley; Afton (El. 6,634; pop. 1,481) - elk antler arch - stopped for a late lunch in the War Memorial Park; Grover (El 6,167 feet; pop. 120), Thayne (El. 6,950 feet; pop. 267) - stopped at a cheese factory to buy cheese, Etna (El. 5,815 feet; pop. 200), Alpine (El. 5,700 feet; pop. 200) - end of the fertile valley and the start of another canyon. Ten kilometers (6.2 miles) into the canyon we stopped to watch people in rafts running rapids on the Snake Rover. We crossed the Snake River several times before arriving in Jackson (El. 6,209 feet; pop. 4,472) at 5 o’clock - 428.3 km (266.1 miles) from Salt Lake City. We drove straight to the Chamber of Commerce, where we were able to phone for motel accommodations and to make the reservations for a Chuck-Wagon “Eat-Out” - we were told that we had to be there by 6 o'clock. It didn’t give us much time to find the Snow King Motel! We did a very quick unpack, donned some warm clothes and were off to meet up with the wagons, just making it on time. There were eight wagons in the train altogether, which took a dirt road for about two miles into the country, It was a fun evening with a good ranch-type dinner and Western music. We arrived back at the motel soon after 9 o’clock and were ready for a good night’s sleep. We left the Snow King motel by 8:30, knowing that we had a full and exciting day in front of us as we would be visiting two national parks. Because Jim Colter's description of the outlandish area he had discovered in 1807 seemed so unbelievable, the region was dubbed "Colter's Hell." Nearly two centuries later, the thousands who view the thermal wonders of Yellowstone National Park each year still find it fantastic. It is a weird, restless land, gurgling and hissing with boiling pools, mudpots and geysers. The Yellowstone River roars through its canyon, taking two awesome plunges over the Upper and Lower Falls along the way. Yellowstone Lake , which has a shoreline of more than 100 miles, is the largest lake in North America to be found at such an elevation - more than 7,700 feet. Although vehicles clog the roads during the summer, there remains regions of the park that are seen only by an occasional backpacker. A few miles of forest-lined highway separate Yellowstone from its southern neighbor, Grand Teto National Park. The beauty here is of a different sort than that of Yellowstone. Leaping almost vertically out of the Jackson Hole, the dramatically serrated Tetons create a breathtaking landscape that is unique in the nation. Magnificent scenery, exciting float trips on the Snake River and plentiful year-round recreational opportunities are seasoned with a liberal dollop of Wild West flavor. We stopped in the center of town to walk through the park with its elk antler arches, before heading out of town past Flat Creek - a big flat “hole” between the hills in which there is an Elk Refuge. Within minutes we were looking at the start of the Grand Teton Range and made several photo stops before turning off US-89, US-26, US-191, known as John D. Rockefeller Jr. Memorial Parkway, onto Teton Park Road at Moose Junction. We were traveling directly towards Grand Teton Peak, and, crossing the Snake River, we went into the Visitors’ Center. I think that we pulled into all the view points along this road to take pictures of the different points of interest. I was somewhat disappointed with some of the views because I had a preconceived notion of what the Grand Tetons would look like, but to see the views so often on postcards and poster one would need to spend much longer in the area! At one point many cars were pulled onto the side of the road and many people had their cameras with them. We stopped, too, and were rewarded with seeing a family of moose, a mother and two young ones. Just before 12:30 and 105 km (62.5 miles) from Jackson we arrived at the South Entrance of Yellowstone National Park (El. 6,686 feet). The written history of Yellowstone dates back to a vague and superstitious warning in William Clark’s journal, nearly 200 years ago. “There is frequently heard a loud noise like thunder, which makes the earth tremble [Indians] state that they seldom go there because [their] children cannot sleep - and Conceive it possessed of spirits, who were adverse that men Should be near them.” Explorers Lewis and Clark did not venture into the land, even for a look. Here we took a look at the map and had to make some hard decisions! The day was half over, we had to see a plastic surgeon within two days and we were due back in Mississauga a week from today - we had to cut our Yellowstone visit short. There was nothing else for it. We decided, therefore, to see Old Faithful, then return to West Thumb on Yellowstone Lake, take the Grand Loop Road then out of the park via the East Entrance. Even having decided to curtail our Yellowstone experience, we still enjoyed our visit very much. We drove by canyons, rivers, crossed the Continental Divide, El. 7,988 feet at 133.5 km. and again, El. 8,391 feet at 146.4 km., snow by the side of the road, Shoshone Point, Craig Pass, El. 8,261 feet at 155.7 km., a lily pond (meant warm water), Keplar Cascades and buffalo. We stopped at some places for photos. Arriving at Old Faithful we had a 70 minute wait to see the geyser erupt, but having come this far we took up front row seats on the boardwalk around the geyser area and waited. As the time of the “show” grew closer the crowd thickened! Whilst relaxing and waiting we could observe numerous small eruptions all around the area. Old Faithful erupts more frequently than any of the other big geysers, although it is not the largest or most regular geyser in the park. Its average interval between eruptions is about 75 minutes, varying from 45 - 100 minutes. An eruption last 1½ to 5 minutes, expels 3,700 - 8,400 gallons of boiling water and reaches a height of 100 - 180 feet. Once we had seen Old Faithful we retraced out route to West Thumb, where we stopped to see the thermal area there beside Yellowstone Lake. We then drove around the lake to Lake Junction (El. 7,792 feet) and turned onto the highway to the East Entrance - crossed the Yellowstone River; saw Canada geese, buffalo, trumpeter swans; Steamboat Point - nothing to see, plenty to hear (the noise was the sound of a steamboat); snow surrounding a bubbling hot pool [East Entrance to Yellowstone had been closed two or three days earlier due to a blizzard, hence the snow would be fresh]; Sylvan Pass (El. 8,530 feet), 6% grade for 3 miles - rock slides both side of the road; at 275.8 km (171.4 miles) exit East Entrance (El. 6951 ft); a very rugged canyon with high cliffs of clay aggregate; North Fork of Shoshone River - going through beautiful farmlands, green and yellow fields often divided with windbreaks of planted trees; many little and big farm/ranch homes; in places as many as 7-10 letter boxes placed together by the side of the road. Our next stop was at the Buffalo Bill Reservoir and State Park, a beautiful blue stretch of water. Leaving the State Park we were surprised to find the road entered a canyon, as we had expected it to follow the perimeter of the reservoir (it looked as if that was where it went!) The next surprise was a long tunnel followed by two smaller tunnels, then a bridge over the Shoshone River. Four kilometers (2.5 miles) later we were in Cody (El. 5,016 feet; pop. 7,897). We went to the Cody Hospital to enquire about a plastic surgeon (needed one for the next day!) - we would have to go to Rapid City, South Dakota, which was a 7½ hour drive east of Cody, or go 100 miles north to Billings, Montana. We were given the phone numbers of three doctors, but could not call until the next morning. Best Western had no vacancies, but we were able to get into the Holiday Inn, where we were also able to have dinner. We were unable to leave early this morning as we had to phone ahead to Billings, trying to get an appointment with a plastic surgeon. Eventually, after five calls, Alice got one at 3 o'clock, which meant that we could spend some time in Cody. Although it was almost 10:30 when we left the Holiday Inn, we were able to spend a couple of hours at the Buffalo Bill Historical Center, a most interesting place, where we could have spent more time quite easily. However, two hours was better than none. We filled up with gas before leaving Cody on WY-120, crossed the Shoshone River over a new bridge and headed for Billings, Montana. It was a most interesting drive: bare hills, western ranch country with cultivated trees around homesteads (Alice said that the rolling land was similar to the downs in the south of England), badlands in the distance just after the turnoff for Chief Joseph Scenic Highway, straight road traveling along the top of a butte (near Two Dot Horse Ranch), stopped for some photos, crossed the Montana border where WY-120 becomes MT-72, Clark’s Fork of Yellowstone River, oil or gas wells, beautiful cultivated and green valley, lovely farms near Sunlight Ranch, road winding along a winding river, Beartooth Mountain Range to our left, crossed Clark’s Fork Yellowstone River again, grazing land near the river, horses and cows, Belfry, farms of spinach or more like sugar beets, harvesting corn for silage, junction with US-310, Bridger, named after mountain man, Jim Bridger, Fromberg, Rockvale, crossed Yellowstone River, oil refinery, and joined I-90 at Laurel, 145.6 km. (90.5 miles) from Cody. We arrived at the Billings Medical Center at 2:50, 174.2 km (108.2 miles). By 4 o’clock Alice had seen the plastic surgeon, had her stitches removed, also the nose splint, which he did not replace. Though still bruised and scarred, Alice certainly looked much better now. We went to Hardee’s for a rather late lunch, stopped at the Chamber of Commerce to take a picture of a lovely sculpture, and were back on I-90, traveling east, by 4:25! We saw our first antelope not long before Hardin, where I-90 turns south through the Crow Indian Reservation, all part of Big Horn country. The Bighorn Mountains, some with snow on their peaks, could be seen in the distance (100 km (62.1 miles) before we were anywhere near them). We were back in Wyoming just after 6 o’clock; photo stop - cultivated fields of corn, Tongue River, Sheridan, scenic turnout for snow fences, Lake De Smet - sage brush, buffalo, badland country both side of the road, Crazy Woman Creek Road, sunset (7:30) and Days Inn, Gillette at 8:20. This morning we were on the road before 7:50 (amazing!) taking I-90 to Moorcroft then exiting on US-14 north to the Devil’s Tower National Monument. Along the way we saw many oil pumps, herds of antelope, and wild turkeys. Just after entering the National Monument Park we crossed the Belle Fourche River (El. 3,850 feet), drove past the Prairie Dog Colony and arrived at the Visitors Center (El, 4,250 feet) at 9:40 (101.8 km - 63.3 miles). We spent 1½ hours hiking the 2 kilometers (1.2 miles) trail around the perimeter at the base of the tower. We counted 20 climbers as we walked around Devil’s Tower. On our return to the Visitor Center we learned that 23 climbers were registered that day - it takes 3 to 6 hours to climb and 1 to 1½ hours to repel. It rises 1,267 feet above the banks of the Belle Fourche River. Its towering presence and mysterious fluted facade stirred the imagination since Indians first dubbed it Mateo Tepee or “Bear Lodge”, Climbers scale Devil’s Tower along no less than 80 different routes to the top, while routine visitors stroll loop trails around its perimeter. On leaving the Visitors Center we had our picnic lunch near the Park Administration Building where we stopped to photograph a deer. We also stopped to watch and photograph the prairie dogs, and it was almost 1 o’clock when we left the park to continue our journey. We went back to US-14, which we took into Sundance - rolling grass hills, a few pines, came over a hill into a vast basin of very red soil, Sundance (El. 4,750 feet, pop. 1,139), where we bought some lotion for Alice as she had developed a rash - not really sunburn, but maybe some kind of reaction to drugs she had been given! After this we rejoined I-90, green grass, red cliffs and soil and at 2:15 (176.5 km - 109.7 miles) we crossed the border into South Dakota. We left I-90 at Spearfish, bough some Aloe Vera gel at K-Mart then turned into Scenic Byway US-14A through Spearfish Canyon , with its beautiful autumn colors on show. At Savoy we made a detour along a forest service road, past Roughlock Falls to the site of the winter camp in the movie “Dances With Wolves”. We returned to Savoy, went on through Cheyenne Crossing toLead (El. 5,320 feet), a gold mining town, and at Pluma turned onto US-385 and thence to US-16 and US-16A through Keystone to Mount Rushmore, arriving at the National Park at 6 o’clock and 342 km (212.5 miles) from Cody via Billings, Montana! We spent an hour here and would have liked to stay to see the floodlights of Mount Rushmore, but using our better judgement we decided we had betterget into Rapid City and find a motel. Mount Rushmore symbolizes the distinctive achievements of the United States as symbolized by four great leaders: Washington represents the founding of the Union, Jefferson, the Declaration of Independence and the Louisiana Purchase, Lincoln, the preservation of the Union and Roosevelt, the expansion of the country and the conservation of natural resources. Created under the direction of Gutzon Borglum, it is one of the larger pieces of sculpture ever created. The crowning achievement of Gutzon Borglum the ageless granite heads were 14 years in the making. Borglum intended to sculpt the Presidents down to the waist, but died before completing the sculpture and no further work was done. The gigantic outcropping of granite from which the memorial was carved is at the top of the mountain, about 1,400 feet from the visitor center. Each face is 60 feet high and carved with an intricate perfection of detail and expression. The Black Hills, so named by the Lakota Indians for the dark appearance given to the slopes by the thick covering of Ponderosa pines, are an island of mountains in a sea of prairies and rangelands about 100 miles north to south and 50 miles east to west, with elevations from 3,250 to 7,242 feet. 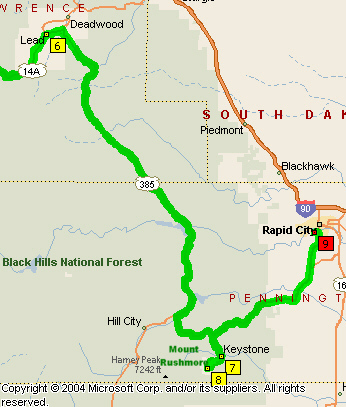 We arrived in Rapid City at 7:22 (373.1 km - 231.8 miles) - to think that we should (!) have been here sometime yesterday if Alice was to see a plastic surgeon in this city!!. There were no vacancies at the Best Western but they directed us to the Bel-Air Motel a block down the road. We settled in, then went for a meal at a restaurant within walking distance. We had had a wonderful day and were pleased with what we had been able to accomplish. We had only two days now in which to reach Lisle (just outside of Chicago), Illinois, as Janice and Kevin were expecting us to stay there Monday night. We still wanted to visit the Badlands National Park and were curious about Wall Drug, a place for which we had seen many signs along miles and miles of highway, even in Wyoming. We left the Bel-Air Motel at 7:40, but, before leaving Rapid City, we made a short detour along Skyline Drive, from which there was a good view of boh the Black Hills and the prairies. We then drove on I-90 until exiting for Wall, the main street of which had a real western appearance. We parked the car at the Wall Drug car park and spent 1¼ hours at Wall Drug. We had a good look around, bought some pottery and had a coffee (5¢) and a snack in the Art Gallery Restaurant. Wall Drug survived the Depression by offering free ice water to thirsty travelers, then grew into an internationally known, block-sized emporium of galleries and unique attractions. Wall Drug still offers free ice water and 5 cent coffee. Wall takes its name from rugged ramparts that form the north rim of the Badlands. From Wall we could go due south to Badlands National Park, arriving there at 10:50. We stopped at a number of the lookouts along the way: Pinnacles Overlook, Rainbow Overlook, Fossil Trail, where we walked along the loop and saw fossil bones displayed in glass top “boxes”, and the Ben Reifel Visitor Center. Sixty-five million years of erosion have carved an eerie lunar scape from the plains of western South Dakota. Deep gorges, saw-edged spires and other striking formations paint a strange and beautiful spectacle over 244,000 acres. Savagely beautiful bad lands comprise nearby Badlands National Park, a region so ruthlessly ravaged by wind and water that it has become a scenic wonderland of chiseled spires, ragged ridges and desert canyons, The landscapes are like being on another planet. Our decision, upon leaving the Badlands, not to stop again for some time was short lived. We were barely out of he park when we came across Prairie Homestead, a registered National Historic Place. Although I had seen a sod house in Gothenburg, Nebraska, this one was different and certainly worth stopping for Alice to see. After this, however, we really needed to move along! The Prairie Homestead is the original home of Mr. And Mrs. Ed Brown who homesteaded this 160 acres in 1909. It was later occupied by Mr. George Carr until 1949. All the buildings except the cave are the same as they were except for maintenance and minor restoration. The cave had collapsed so was dug out and rebuilt in the spring of 1966. The original homestead is preserved as though a homestead family was living there today. A small portion of the furnishings is original, the rest typical of the Sodbusters in this area. It was already 1:53 when we rejoined I-90 and we had only traveled 163 km (101.3 miles)! We entered the Central Time Zone at 2:45 and immediately lost an hour, something we hadn’t stopped to think about. When I was traveling out to Utah the time zones worked to my advantage, whereas they were now against us. Oh well! For about 200 kilometers (124.3 miles) we drove across the prairie, then the countryside seemed to change. It became hilly and there were lots of trees around the Missouri River valley. We crossed the river, took a fifteen minute break at the Scenic Overlook, then continued on. After crossing the river the land flattened out again with cornfields everywhere. We took another break at Mitchell to see the famous Corn Place, a really fascinating place, its walls decorated with pictures made of cobs of corn, grains and grasses. There was a festival going on in the street - the Corn Place Festival, which is held mid September each year. A truly unique attraction dating back to 1882, the Corn Place was built to encourage settlement and prove the richness of eastern South Dakota soil. It is decorated inside and out with thousands of bushels of native corn, grain and grasses. Back on I-90 we drove for another hour as we had set Sioux Falls as our destination for the day. We arrived at the Days Inn at 8:40, had a light meal, then retired, having set the alarm for an early start next morning. We had our biggest day yet in front of us! We left Days Inn, Sioux Falls by 6:45 and crossed the Minnesota border fifteen minutes later. The sky was heavy with dark clouds - the news had said to expect thunderstorms and there had already been ½ inch of rain. Alice noted that the farms were no longer so far apart and were generally surrounded by trees, and the farm buildings and farmhouses seemed neater and better maintained than in the west. The road had 12 inch square lined patches just off the edge of the road before going off the shoulder - rumble strips to alert straying drivers! We stopped for gas at Jackson, then at Albert Lea to have coffee at McDonald’s. . We passed through a very rich agriculture area, with well kept farms, farm buildings and equipment. We left the highway again at St. Charles to visit the Amish Market there, having seen a billboard for it along the way. We enjoyed looking at the crafts and bought some lunch items. Back on I-90 the country became quite hilly and there were many more trees; the farms had more silos, indicating bigger or richerfarms and more animals. Within half an hour we were descending the valley of the mighty Mississippi River, driving parallel with it, although it was hard to tell the actual course of the river because of its meandering way, islands and peninsulars. To our right were high, rocky, vegetation-covered cliffs or palisades. From the bridge across the Mississippi we could see a post marking the channel in the river. At 471.2 km (292.8 miles) 451 km (280.2 miles) since crossing the South Dakota/Minnesota border, we now crossed the Wisconsin border. It was time to take a break and we had our lunch at the Welcome Center. From La Crosse, where we had entered Wisconsin, we wanted to follow the Great River Road, WI-35, along the east side of the Mississippi, but were forced to take major detours due to the River Road being closed at De Soto. We started out along the River Road through Stoddard (pop. 775) - egrets, algae, water lilies, Genoa (pop 266), Victory (Unincorporated), De Soto (pop. 326) - detour, Mt. Sterling (pop. 217) - beautiful pee wee hydrangeas, Seneca (Unincorporated). Eastman (pop. 369+, 8% grade down to Prairie du Chien (pop. 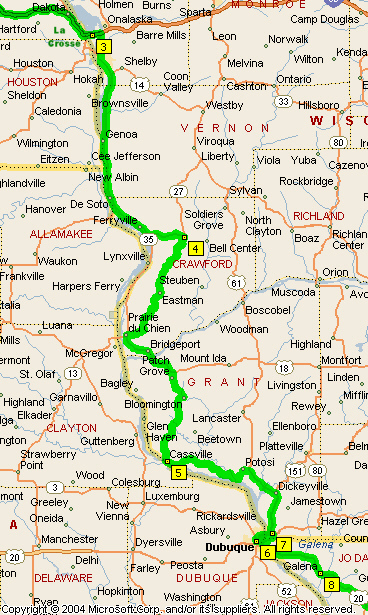 5,657) and Mississippi River, crossed the Wisconsin River at Bridgeport, Patch Grove (pop. 202), Bloomington (pop. 776), Cassville (pop. 1,144), stopped to take pictures of the cornfields - we had been driving by cornfields for many miles, but the road was narrow and the traffic was quite heavy due to the detour, Potosi (pop 654), then missing a turnoff we found ourselves on a freeway, taking us on a bridge over the Mississippi River into Dubuque, Iowa (718 km 446.1 miles - 5:23). At Galena we got gas, had hamburgers for supper at McDonald’s,took a picture of Belvedere, one of many beautiful homes in this historic town, where General Grant’s house is situated. It would have been great if we could have spent some time here. We phoned Janice to let her know where we were and find out the best or fastest route from Galena to Lisle. We took US-20 from Galena and it was dark by the time we reached Freeport. We continued on US-20 until I-90, a toll road at this point, thence to I-355, also a toll road, exiting at 75th Street and arrived at Janice’s and Kevin’s at 9:30, having driven 1016.4 kilometers (631.6 miles). Today we were able to sleep in and enjoyed a leisurely morning, Janice did not have to go to work, so offered to take to us to Oak Park so Alice could visit the Frank Lloyd Wright House and Studio (I had been telling her all about it). After this we bought submarine sandwiches for our lunch, which we ate sitting in Janice’s van. The weather had really turned bad - sky became very black and there was a heavy downpour. It was decided that it would be useless to proceed into Chicago, or even think of going up the Sears Tower. Instead we headed back to Lisle, stopping at the outlet store for Wilton Cake Decorating factory, by which time the weather had cleared a little. Therefore Janice took us to Naperville, the municipality adjoining Lisle. We walked along the river front and to Naperville’s historic village. All the buildings were closed for the season, but we were able to walk around the village. We returned home and Janice made a delicious supper - Ginger Cream Chicken. It was good to have a home cooked meal again! Kevin arrived back late in the evening from his business trip to Florida, and we all retired for the night. By the time that Alice and I were up, everyone had left for the day, so we packed, had some breakfast and got on our way ourselves, leaving Janice’s and Kevin’s by 8:45. From their place we took I-88 (Toll way) and I-290 into Chicago and I was able to find my way to the North Pier Parking Lot. From here we walked past the Chicago Tribune building to Michigan Avenue, back along the Chicago River, saw the water arch from Centennial Fountain, had lunch at the Sheraton Hotel and Alice did some shopping at North Pier. After this it was time to get on our way and head for home! We left North Pier at 12:30 and, as soon as possible, got onto I-94. We missed the sign for the Illinois/Indiana border (probably because the area is very built up and there are so many other signs along the road). It was almost 2 o’clock (167.7 km - 104.2 miles) when we crossed the Indiana/Michigan border and changed time from Central to Eastern, losing another hour! Other than stopping for gas near Jackson and again at Dearborn, we drove non-stop to Detroit, and missing the turnoff for the Ambassador Bridge, we were able to find our way without too much trouble through downtown Detroit to the Detroit/Windsor Tunnel under the Detroit River. We were in Canada at 7:15, and went through Customs very quickly (weren’t even asked for passports or identification). 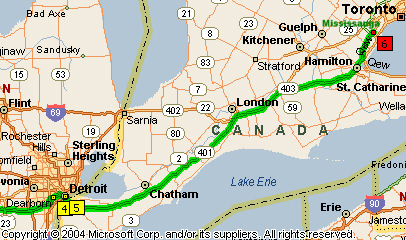 We were through Windsor and on ON-401 by 7:30 (526.5 km - 327.2 miles) and two hours later stopped at a service center for coffee. We phoned LP to let him know where we were and at what time we expected to be home.